A lot is happening right now off the field for No. 18 UCF. Blocking out the outside noise about rankings, projections and coaching changes will be much easier for the Knights (7-0, 4-0 AAC) on Saturday when they have a task to take care of, which is knocking off a tough Mustangs (6-2, 3-1 AAC) team. The Knights are all over the national news these days. While some of it is for their perfect record and top 25 rankings, more of it is surrounding Frost’s future. With openings at Florida and Tennessee, along with the impending opening at his alma mater of Nebraska, the 42-year-old coach is at the center of speculation all over the country. That’s the nature of a Group of Five program having success. Coaches are going to have their names thrown around for jobs at bigger programs, even in the middle of the season. Frost, true to his own principles, is just focusing on what is right in front of him. His team is undefeated and in the middle of what could turn out to be a historic season. Not only that, but he is about to welcome a new addition into his family. He and his wife, Ashley, are set to become first-time parents any day now. The baby was due on Wednesday of this week, which means there is a possibility that Frost misses Saturday’s game at SMU. If he does stay in Orlando, or come back after landing in Dallas, defensive coordinator Erik Chinander will assume head coaching duties. Offensive coordinator Troy Walters would call plays. 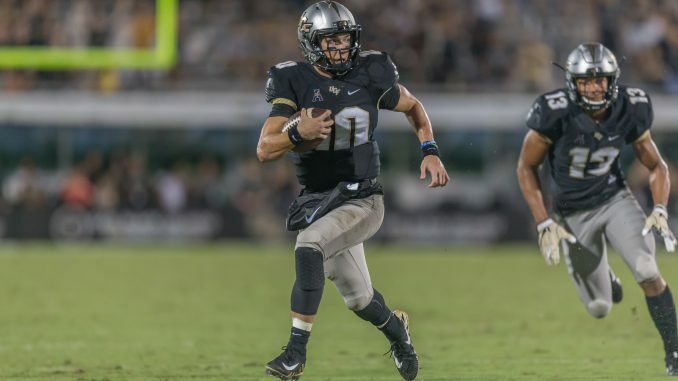 Saturday’s game will be no cakewalk for UCF. It is facing a potent SMU offense that is averaging 41.5 points per game, which is good for ninth in the nation. Sophomore quarterback Ben Hicks has a variety of talented weapons at his disposal, most notably juniors Trey Quinn (79 catches, 874 yards and seven touchdowns) and Courtland Sutton (43 catches, 706 yards and nine touchdowns). Sutton is projected to be one of the first receivers selected in next April’s NFL Draft. For all of their firepower on the offensive side of the ball, the Mustangs aren’t quite there yet on defense. They have allowed 31 points per game this season, which ranks them 95th in the country. That’s a welcome sight for UCF, which is averaging a nation-leading 51 points per game this season and is coming off a 73-point performance against Austin Peay. The Knights defense is still solid, but the offense has proved that it can carry the team at times if necessary. That’s not something that could’ve been said last year. Kickoff for Saturday’s conference matchup is set for 7:15 p.m. The game will be televised by ESPN2.